Santa Barbara, CA—August 21, 2012—Mastering the Nikon D800 (Rocky Nook, $39.95 USD), by Darrell Young provides a wealth of experience-based information and insights for owners of the new D800 camera. 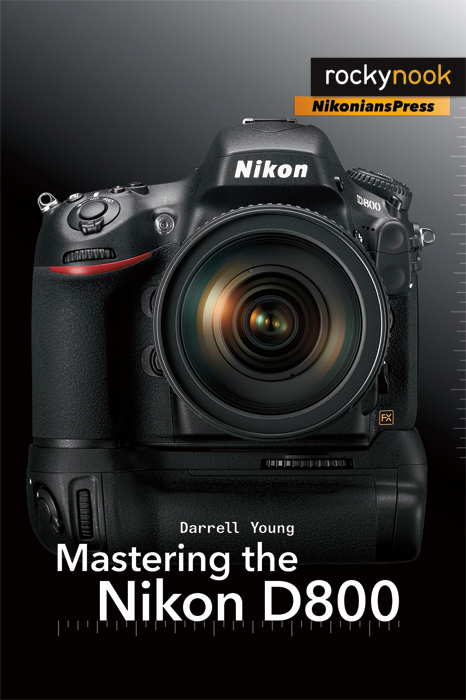 Darrell is determined to help the user navigate past the confusion that often comes with complex and powerful professional camera equipment.This book explores the features and capabilities of the camera in a way that far surpasses the user’s manual. It guides readers through the camera features with step-by-step setting adjustments; color illustrations; and detailed how, when, and why explanations for each option. Every button, dial, switch, and menu configuration setting is explored in a user-friendly manner, with suggestions for setup according to various shooting styles. Darrell’s friendly and informative writing style allows readers to easily follow directions, while feeling as if a friend dropped in to share his knowledge. The learning experience for new D800 users goes beyond just the camera itself and covers basic photography technique. For a review copy or more information please email rockynookpr@oreilly.com. Please include your delivery address and contact information. Darrell has used Nikon cameras and Nikkor lenses since 1980. He has an incurable case of Nikon Acquisition Syndrom (NAS) and delights in working with Nikon’s newest digital cameras.Living near Great Smoky Mountains National Park has given him a real concern for, and interest in, nature photography. View Darrell Young’s full profile page. Rocky Nook’s books are distributed internationally by O’Reilly Media. Rocky Nook was founded in early 2006 in Santa Barbara, California, and is closely associated with dpunkt.verlag, a leading publisher of books on technology based in Heidelberg, Germany. The focus of Rocky Nook’s publications is on digital photography and computing. O’Reilly is a registered trademark of O’Reilly Media, Inc. All other trademarks are the property of their respective owners. You are receiving this email because you are a public relations contact with O’Reilly Media.If you would like to stop receiving any and all press releases from O’Reilly, please email: press@oreilly.com.